Take a look at the universe with our Professor of Extragalactic Astronomy, Carole Mundell. “I have looked further into space than ever human being did before me,” wrote William Herschel in 1780. From his garden in New King Street, Bath, Herschel had scanned the night sky using a telescope he had built himself and saw Uranus. It was a discovery which effectively doubled the size of the then known Universe, and secured his adopted city a place in the history books. Twenty-first century astronomy moves faster than in the days of the ‘gentlemen astronomers’. As ever more powerful telescopes come on line, discoveries are being made every day; yet to be successful in the field still requires Herschelian curiosity, ingenuity and a can do approach. Enter Bath’s stargazer-in-residence, Professor Carole Mundell. 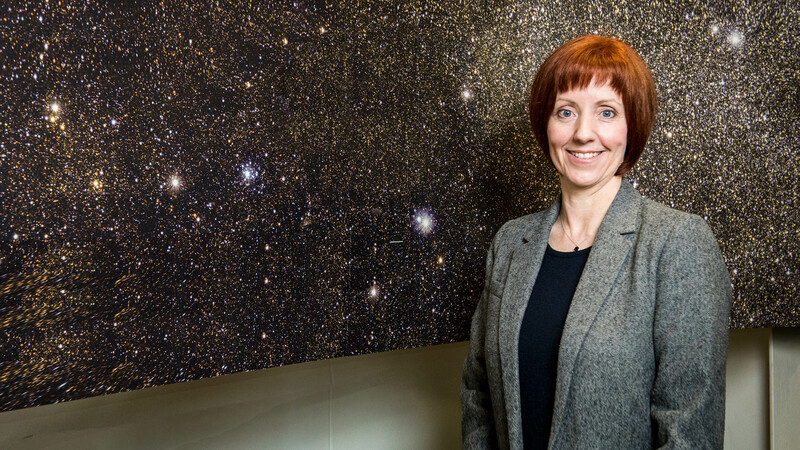 Carole, Professor of Extragalactic Astronomy, joined the University of Bath as head of Astrophysics, and is now Head of our Department of Physics, while leading our Physics with Astrophysics undergraduate course and also building up her new research group. Carole is animated as she discusses her research. “I’m particularly interested in black holes of all sizes and scales, their origin and influence on the environment around them, and ultimately how we can use them to probe broader laws of physics,” she explains. The term ‘black hole’ is scientific short hand for a dense region of space inside which the pull of gravity is so strong that nothing can escape, not even light. Matter circulating near, but not inside the black hole, will heat up, shine brightly and may even be kicked back out into interstellar space if magnetic fields are there to drive the matter outwards, away from the hungry black hole. Gamma ray bursts were discovered by accident in the 1960s, when miliarty satellites orbiting Earth mistook them for evidence of rogue states breaking the nuclear test ban treaty. Now confirmed as cosmic rather than terrestrial in origin, these bursts are compelling because they represent what Carole terms ‘the realm of extreme physics’. By analysing gamma ray bursts using telescopes around the world and in space, observational astrophysicists like Carole gain information about the physical processes that produced them. But their field is at a tipping point. Currently around two bursts are recorded a week, but new facilities under development are set to revolutionise their work by surveying vast swathes of the sky in real time. Carole’s team are at the vanguard of this new kind of science but the possibility of receiving notification of up to a million new events every night is daunting. This ‘big data’ challenge is one which Carole predicts will require interdisciplinary innovation, bringing together astrophysicists, mathematicians, physicists, engineers and computer scientists. Carole’s high-school teachers further encouraged her talent for physics. She puzzled over the deeper physics underlying basic high school physics. After a lesson on energy, she was concerned she was failing to understand something important. She asked her teacher ‘But what is energy?’ “He reassured me not to worry about it for my exam, but to think about going to university, where I might learn why this was such a difficult question to answer!” she laughs. In 2016, ahead of hundreds of candidates, Carole was named Woman of the Year at the FDM Everywoman in Technology Awards, which celebrate outstanding achievement in fields traditionally dominated by men. Carole spoke to audiences at New Scientist Live about her research. If you were lucky enough to catch her either at this event or another in the future, you’ll be in for a whirlwind experience as she whizzes through her research, from a brief history of cosmic endeavour from Copernicus to Einstein, to what a gravitational wave sounds like, to why the black hole portrayed in Hollywood blockbuster Interstellar should have failed its screen test. Typically, her audiences are mesmerised, and bombard her with questions. Why is our galaxy flat? What would happen if you fell into a black hole? If the universe is expanding, where is it expanding into? “It is a privilege being able to make a living doing something you love,” Carole admits. And it’s clear that her enthusiasm rubs off on her audiences as she speaks – some of whom might become candidates for studying Astrophysics here at the University in years to come. When William Herschel built his telescope it was unthinkable that he would discover a whole new planet through it. Whatever discovery the world is on the verge of next, there’s a good chance that Carole, her research group, and students at Bath will be at the forefront.